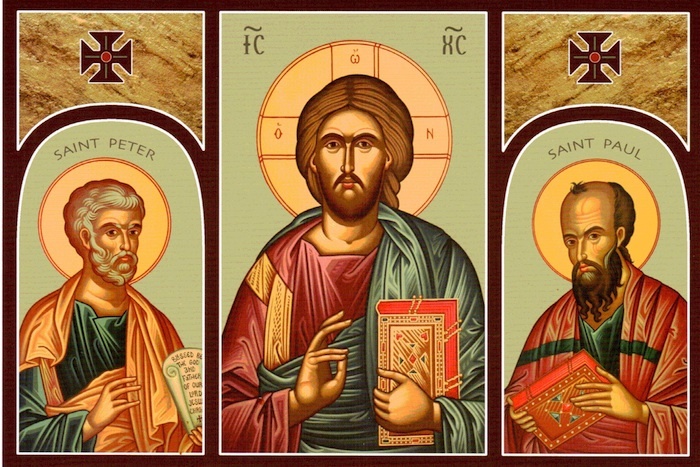 On this the Solemnity of Saints Peter and Paul I will speak on the varieties of Revelation that each Apostle received from Jesus Christ, and what said Revelation means to us and to our Church today. There really is only one great Revelation—the Word made Flesh—but each of us receives it differently, in the amount and to the degree to which we are prepared. Such Revelation will always materialize for us if we want to know the will of God, not by flesh and blood but by Our Father who is in heaven. That means that we need to tune in, to be attentive to the discernment of Spirits through prayer and then to confession of faith. Let us look to the lives of Peter and Paul, the twin pillars of the Church who gave their lives to Christ and who continue to inspire and to empower more than 2,000 years after their martyrdoms. We begin with Peter, the “prince of the Apostles.” Peter’s understanding of the truth, that Jesus was the “Son of the living God,” happened gradually, over the course of the three years he shared with the Lord during Jesus’s earthly ministry. In the gospel we see the growing awareness of Revelation in Peter that allows him to publicly confess the truth in his heart revealed to him by God. For his faith Peter is rewarded by Jesus who confers on him the keys to the kingdom (Mt 16:16, 19). Jesus transforms him from peasant fisherman to the Vicar of Christ on earth. We also give thanks to God on this day for the Apostle Paul, who preached the gospel with every breath he took until the day he breathed his last. In Paul’s case, the realization that Jesus was the Son of God happened instantly, when he saw the risen Lord near Damascus. Revelation struck Paul blind. Baptism illuminated his mind and awakened his soul. Immediately he believed that Christ was the fullness of Revelation, God’s one, holy, true, and perfect Word. Formerly an enemy of the Church, Paul’s change of heart is legendary; he rarely looked back on his former way of life, and only then to emphasize God’s mercy. Of Paul’s new found vocation Saint Luke in the Acts of the Apostles writes: “At once began to proclaim Jesus in the synagogues, that he is the Son of God” (Acts 9:20). And all who heard him were astonished. The book known as the Acts of the Apostles has been referred to as a ‘history of the early Church’; indeed it is, but it is a vertical history. 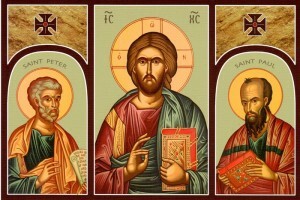 Acts is not simply an account of the growth of the Church but is a testimony of the working of the Holy Spirit who impels Peter and Paul and their disciples to preach the truth, that is, “truth” with a capital “T.” Both men received divine mandates to evangelize and together they offered salvation to the nations. And at the Council of Jerusalem in AD 51 (Acts 15:1—29; Gal 2:1-10). The Book of Acts is the setting where they connect to proclaim the presence of the Holy Spirit, who guides the Church through the ages on a never-ending journey. Destination: eternity. Think of Acts as a high-speed train; the Holy Spirit is the engineer. Acts is the celestial express that carries those who believe and those who want to believe across the landscape blazed long ago by the Apostles to the station of Divine Revelation. Peter stands by the gate with his keys. Paul with his canon of letters enlightens the hearts of faith seekers, providing ample reading to prepare for entrance into heaven. The Solemnity of Saints Peter and Paul commemorates and affirms the life, martyrdom, and perpetual presence of the Apostles whose work we carry on today. In his second epistle Peter writes: “There is no time with God: a single day; a thousand years: it is the same” (3:8). Yet there is a timeliness to these words, as in there is no time to lose in saving souls and helping one another to board the holy vessel on a one-way journey bound for paradise. We who honor and revere the Apostles determine the spiritual condition at which we arrive at Revelation Station. Don’t resist the calling of the Spirit of Jesus revealed to us by God the Father in heaven. When we stand before Peter with his keys at the gate we want to be able to repeat the dying words of Paul his eternal partner: “I have competed well; I have finished the race; I have kept the faith” (2 Tm 4:7). If we can say this then choirs of angels will sing: “Open up the gates of holiness; enter and give thanks” (Ps 118: 19).